Every hill has its own story, and every hill is special to someone. That anonymous forested hill you pass on the way to somewhere could well be one of the most special places in the world to someone else. We can see evidence of this as we ramble amongst the hills. Often these are in the form of an inscribed plaque or a cross, and may command fine views across the land. On the summit of Slievecorragh is one of the more curious memorials that you will find anywhere in Ireland. It is the chair that climbers of this hill have commented on. There is a man’s silver ring slipped over one of the support bars, and the name ‘Dan Clancy’ is engraved into the top of the back of the chair. The chair and the teddy are facing west over the plains of Kildare. For the walker it is an object of curiosity, and offers a comfortable seat to take a rest and enjoy the views. It is made of bronze, and someone clearly went to a lot of trouble to bring it all the way up the hill. It would have been easy to leave the hill and move on to other things and forget about the curious chair and the lonely teddy on Slievecorragh. But it stayed in my mind and I wanted to find out more. I discovered that Dan Clancy grew up on the side of Slievecorragh. Dan and his many siblings spent many happy childhood days there, and often went up in the evening to watch the sun set as they discussed all the things that children do. Dan eventually grew up and moved to New York. Whenever he returned to Wicklow he would climb Slievecorragh with his brothers and sisters where they spent many hours in conversation, just as they had done as children. Their special connection with this hill and each other was reaffirmed each time they enjoyed watching the sunset from its summit once again. Dan became terminally ill with cancer in New York. One of his brothers, Andrew who is a Sculptor, spent a lot of time with him in New York in his final months. They talked about their childhood and Andrew frankly discussed with Dan how he would like to commemorate him in some way. The idea of the chair was born. 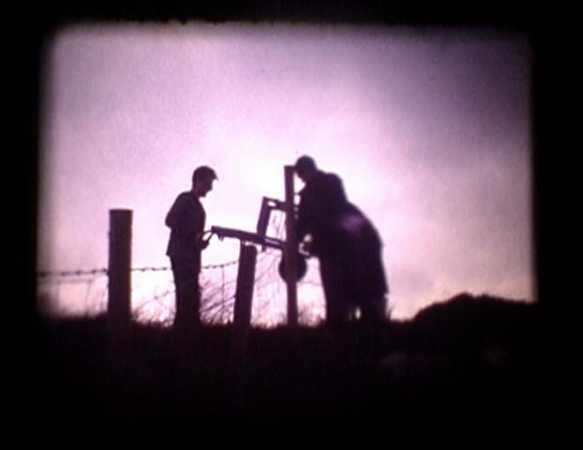 It was based on an old chair that both men remembered as boys in the corner of their kitchen, and it symbolised a warm and happy childhood spent growing up on the slopes of Slievecorragh. From an old photograph Andrew had a wooden model of the chair made, and he used this to cast the bronze chair that we see on Slievecorragh today. Dan passed away on 4th February 2004 at the age of 31. A few months later Dan’s family and friends gathered on Slievecorragh to bring the chair to the summit and set it into the ground. Since then, each year on the anniversary of Dan’s death, his family gather once more to climb the hill and remember Dan Clancy.